Tristar is your local Val-Co dealer. Why choose Val-Co products? 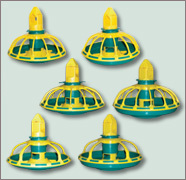 Val-Co broiler feeding products are designed for high strength and easy cleaning.Productive feeding operations demand precision on all levels. For storage, delivery and distribution, VAL-CO™ feeding equipment is fine-tuned and time-tested to reduce waste and maximize operational efficiency.